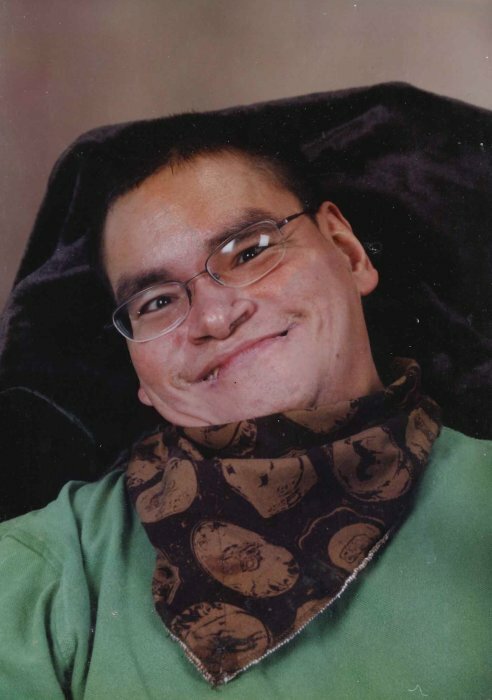 Richard “Ricky” Joseph Cutbank, Jr., age 49, of Bemidji, Minnesota journeyed home from the Jack Pines Group Home in Bemidji, MN on March 31, 2019. Richard was born in Bemidji, MN on June 27, 1969 to Angeline (Benais) and Richard Cutbank, Sr.
A wake for Ricky will begin at 11:00 a.m., Thursday, April 4th and continue until his 1:00 p.m. funeral service on Saturday, April 6th. All services to be held at the Veteran’s Memoria Building in Cass Lake, MN. Pastor Tim Brown will officiate. Pallbearers for Ricky will be Shaun Windom, Sr., Jack Cutbank, Daniel Loeken, Gary “Josh” Miettinen, Jr., Wakon Windom and Deland Starr. Alternate pallbearers are John Loeken, Neil Cutbank and Robin Windom, Jr. His honorary pallbearers are Cody Knutson, JT Knutson, Jeff Oakgrove, Jr., Scott Miettinen, Christopher Miettinen, Sr., all his nieces and nephews and the REM and Jack Pines Staff. Interment will be in the John Brown Cutbank Cemetery at Pennington, MN. The family of Ricky would like to send a very special “Thank You” to our oldest sister Roselyn Loeken for being his guardian for the past 20 years and to the REM and Jack Pines Staff for taking such good care of him for us. Special thank you also to “Gramma” Karen.